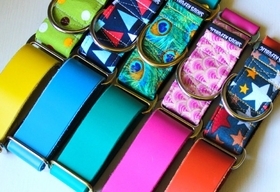 PRISMArtingales are our colorful, adjustable leather martingales that work smoothly and are comfortable like nylon martingales! Combining beauty and durability, they have a leather body and nylon control loop. Design your own by mixing leather and fabric. Choose from our nylon collar fabrics to go with our colorful designer latigo leather. We only use the best materials that are manufactured in America and make each one by hand, you can be confident of your purchase. Thank you for shopping U.S.A handmade!